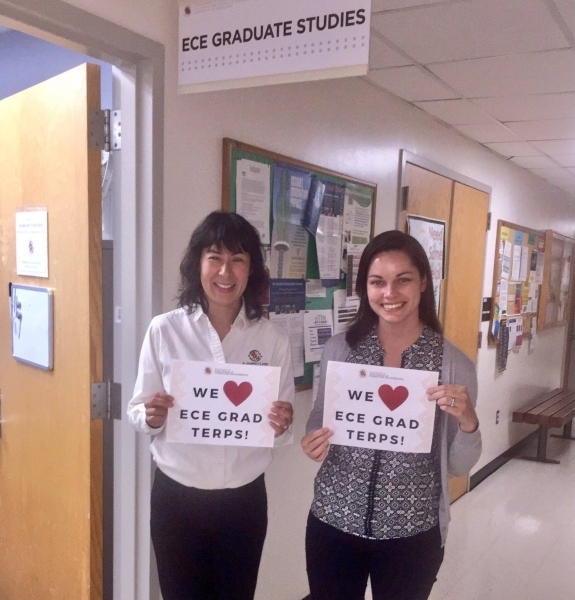 Opportunities for ECE graduate students are broad and diverse. Our faculty and staff are eager to help you navigate degree requirements, discover new research opportunities, and build relationships with industry and agency partners. The purpose of the ECE GSA is to improve the quality of education and enhance the quality of life of the ECE graduate students. For more information regarding fellowships and awards offered by the Graduate School, college/department, and external sources, please see the Fellowships and Awards page of the ECE Graduate Handbook. View the list of Forms for current graduate students. The ECE Graduate Handbook is the official compendium of policies, procedures, and resources for the use of graduate students in the ECE MS and PhD program. Complete information about the written qualifying examination may be found in the ECE Graduate Handbook. Please also consult the Flowchart of the ECE PhD Qualifying System. GSO Staff celebrating Graduate Student Appreciation Week.